Future Life Design presents a new scientific methodology for optimizing a person’s reincarnation skills to improve their reincarnation skills and yield higher quality future lives. Entirely new kinds of future lives can be opened up through the scientific application of modern astronomy, neurology, psychology, and physics. 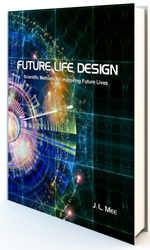 Future Life Design introduces a new trans-life cognitive science for enhancing a person’s reincarnation skills and improving the quality of their upcoming lives. Higher quality future lives can eradicate suffering and expand joy. The methodology is grounded in a revolutionary 21st Century trans-life memory science. "I believe J.L. Mee is a "ground-breaking theorist" in the field of how our behavior and thoughts are eternal, affecting life after life after life." The work multiplies a person’s freedom and range of choices, opening a gateway to better future lives, and also a channel for positive change today. Awakening the student into a realization of their spiritual identity is the goal of many programs. It is the starting point for this program. This is an advanced course of study. The information contained in this book is of interest to progressive individuals in a global audience of one billion people who accept reincarnation. Its widespread application can accelerate humanity’s conscious evolution to premium-quality future lives.